Late at night, exhausted and desperate, Cara Burrows lets herself into her hotel room and is shocked to find it already occupied by a man and a teenage girl: Melody Chapa, the most famous murder victim in the country. Cara Burrows has left a note for her husband and two children with the date that she'll be back home. She hasn't told them that she is flying to America. She hasn't told them about the five star spa resort she has secretly booked herself into. She hasn't told them why she's gone. She just needs some time alone, to think. When she finally arrives at the resort, tired and phone-less in the middle of the night, the last thing she expects to find are two people already in her hotel room. A simple mistake made by the resort's receptionist sees Cara soon embroiled in a situation she can hardly begin to understand, at the centre of which is America's most famous murder victim, who Cara is sure is the same girl she saw in her hotel room on that first night. Could Melody Chapa still be alive? And if she is, then how did her parents end up serving life sentences for her murder? The chances of an English tourist happening to see the supposed dead girl entirely by accident may seem pretty slim but Cara isn't the only guest who thinks she's seen Melody at Swallowtail Resort. 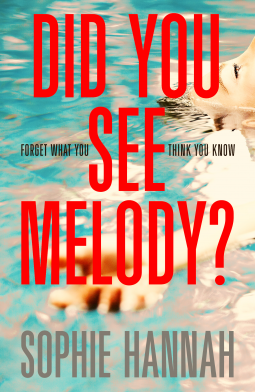 With a possible murder and a definitely dangerous secret at the heart of it, Did You See Melody? walks an interesting line in terms of tone. Hannah balances the suspense filled plot with unexpected humour, which at times had me snorting in front of my eReader. It's an enjoyable novel, certainly, with plenty of twists and turns to keep you hooked from almost the very beginning. We don't begin with the mystery straight away but first take a little while to set up Cara's reasons for leaving her family to travel alone to America (something that maybe feels a bit of an overreaction as things become clearer), but once Cara begins her investigation into the famous murder of Melody Chapa the novel really gets its legs. Cara, not being a local, doesn't know anything about the Melody Chapa case so the reader gets to discover the specifics slowly, as Cara does, through articles and TV transcripts. Some readers may find these intrusive to the story but I felt they came in at the right moments, telling Melody's story - at least, the version everyone knows of it - alongside Cara's. The only problem is that at times I began to feel as though Cara was little more than a device intended to react to Melody's story and nothing more. Until about midway through the novel anyway. Then we begin the twists and turns that I suppose make this a psychological thriller. Personally, I didn't find much of it particularly thrilling. In my opinion the strength of this novel lies not necessarily with Cara's story, or even with Melody's, but with those of the surrounding characters: the outspoken hotel guest who involves herself in the mystery, determined to find the truth, and the famous criminal commentator who single-handedly twisted the whole of America to her way of thinking with her TV show during Melody's original murder trail. Did You See Melody? is an enjoyable read and as a funny and over-the-top take down of 'trial by media' it works. I'm just not entirely sold on the thriller part. Features | I met my Goodreads goal - what's next?